Global Wealth Report 2017: Where Are We Ten Years after the Crisis? 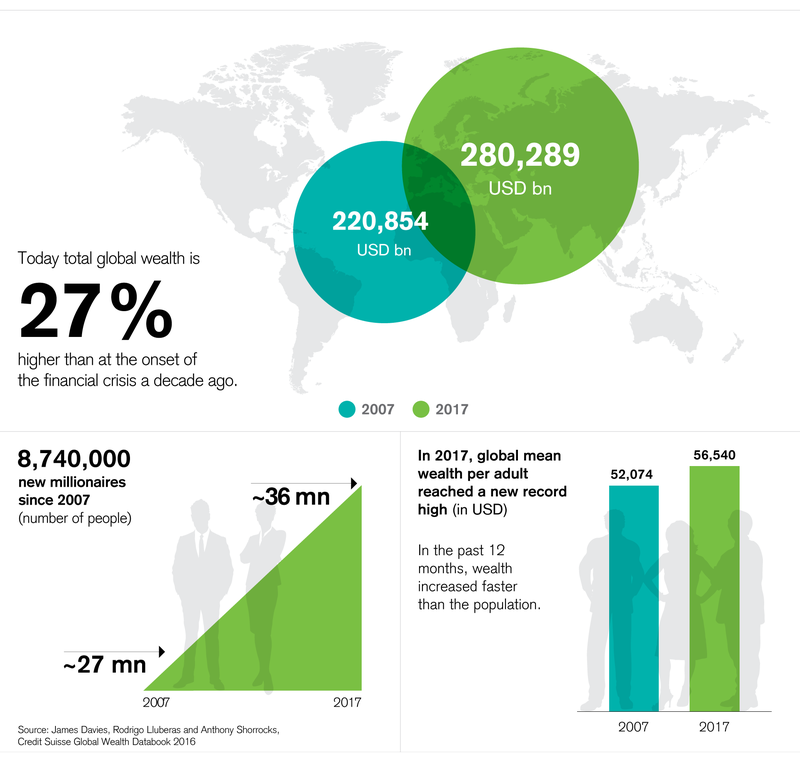 As shown in the latest edition of the Global Wealth Report by the Credit Suisse Research Institute (CSRI), total global wealth has now reached USD 280 trillion and is 27 percent higher than a decade ago at the onset of the financial crisis. In the past 12 months, total global wealth grew by 6.4 percent. It is the fastest pace of wealth creation since 2012 and one of the best results since the financial crisis. Moreover, as wealth increased faster than the population, global mean wealth per adult reached a new record high of USD 56,540. Comparing wealth gains across countries, the United States is an unquestionable leader. The country continued its remarkable unbroken spell of gains after the financial crisis and added USD 8.5 trillion to the stock of global wealth. In other words, the US generated more than half of the total global wealth aggregation of USD 16.7 trillion of the past 12 months. "So far, the Trump Presidency has seen businesses flourish and employment grow, though the ongoing supportive role played by the Federal Reserve has undoubtedly played a part here as well, and wealth inequality remains a prominent issue," commented Michael O'Sullivan, CIO for International Wealth Management at Credit Suisse. "Looking ahead, however, high market valuations and property prices may curb the pace of growth in future years." In line with global wealth growth, wealth in Europe increased by 6.4 percent thanks to stability spread across the continent. From Europe, Germany, France, Italy, and Spain made it into the top ten countries with the biggest gains in absolute terms. Converted into percentage terms, the biggest household wealth gain globally was recorded in Poland. The increase of 18 percent was driven mainly by rising equity prices. Switzerland continues to lead the ranking in terms of both average and median wealth per adult in 2017, the latter favoring countries with higher levels of wealth equality. 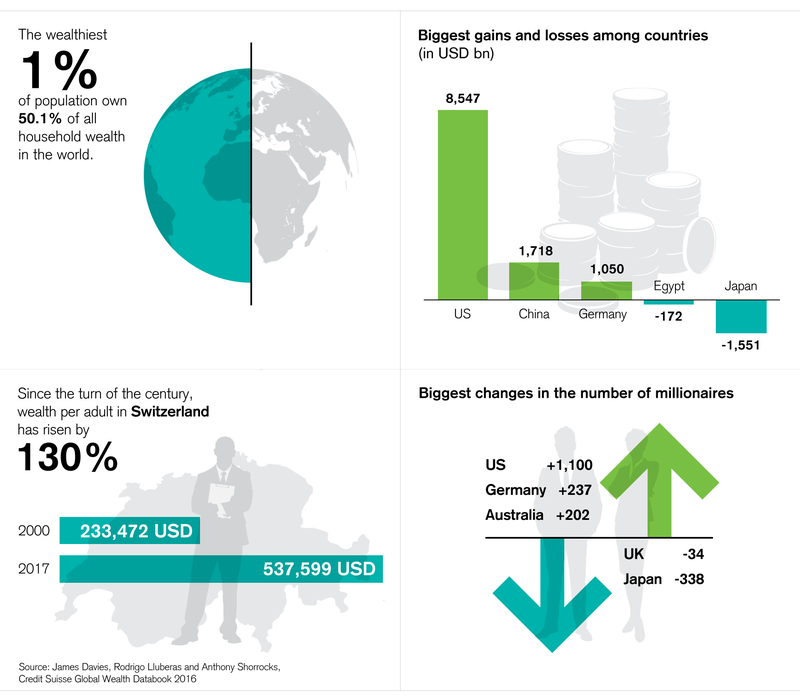 Since the turn of the century, wealth per adult in Switzerland has risen by 130 percent to USD 537,600. 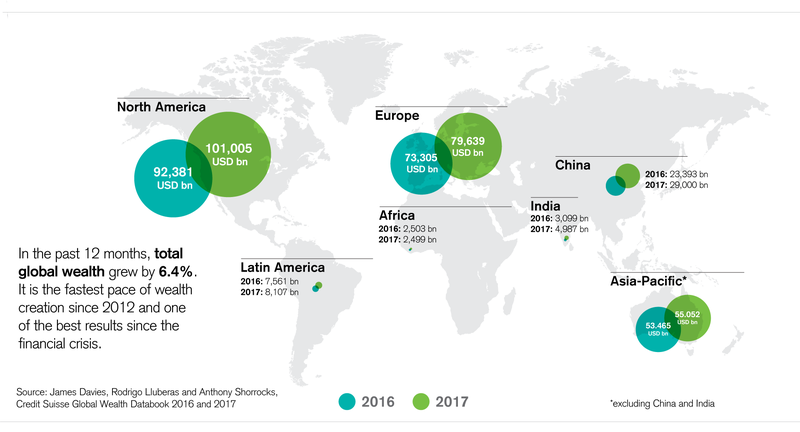 While the majority of wealth is still held by high-income economies in North America, Europe, and Asia Pacific (excluding China and India), new wealth creators are becoming more visible. China, after suffering losses of 20 percent during the crisis, quickly overtook its pre-crisis level of wealth growth. This year, its pace of wealth creation caught up with the pace of Europe, and its input to the global wealth stock was USD 1.7 trillion. This represents the second highest absolute wealth gain after the US. According to the Global Wealth Report, the geographical coverage of wealth growth in the first years of this century was more widespread than ever before. The upward trends were steady across financial and non-financial asset classes, and regions. Emerging economies were becoming strong global players. Last but not least, all levels of society were benefitting from the rewards. While global mean wealth per adult grew at 7 percent per year between 2000 and 2007, the bottom half of wealth holders did even better: Median wealth per adult grew at 12 percent per year. In 2007 the global financial crisis brought this episode of growth to a halt, wiping 12.6 percent off global wealth. Shortly after the crisis, wealth growth resumed. It has managed to recoup the lost ground and rise further, but the average pace of growth has been less than half the pre-crisis rate. In the 12 months to mid-2017, significant rises in wealth were evident throughout the world, driven not only by robust equity markets, but also by substantial increases in non-financial wealth. It may signal that we are reverting to the pre-crisis pattern of growth. The remaining negative heritage of the financial crisis is wealth inequality. It has been rising in all parts of the world since 2007. As calculated by the report authors, the top 1 percent of global wealth holders started the millennium with 45.5 percent of all household wealth, but their share has since increased to a level of 50.1 percent today. According to the report, global wealth should continue to grow at a similar pace to the last half a decade and is anticipated to reach USD 341 trillion by 2022. Emerging economies are expected to generate wealth at a faster pace than their developed peers, and are likely to achieve a 22 percent share in global wealth at the end of the five-year period. Unsurprisingly, the strongest contribution is expected from China and is estimated at around USD 10 trillion, an increase of 33 percent. The outlook for the millionaire segment is more optimistic than for the bottom of the wealth pyramid (less than 10,000 dollars per adult). The former is expected to rise by 22 percent, from 36 million people today to 44 million in 2022, while the group occupying the lowest tier of the pyramid is expected to shrink by only 4 percent. The eight edition of the Global Wealth Report published by the Credit Suisse Research Institute provides the most comprehensive and up-to-date source of information available on global household wealth. The Global Wealth Report is compiled from data on the wealth holdings of 4.8 billion adults across approximately 200 countries – from billionaires in the top echelon to the middle and bottom sections of the wealth pyramid. The robust methodology, established over many years of analysis, provides transparent information on the Global Wealth Report's underlying sources and their quality. The Credit Suisse Research Institute is Credit Suisse's in-house think tank. The Institute was established in the aftermath of the 2008 financial crisis with the objective of studying long-term economic developments, which have – or promise to have – a global impact within and beyond the financial services sector. Is active Global Wealth Report 2017: Where Are We Ten Years after the Crisis?